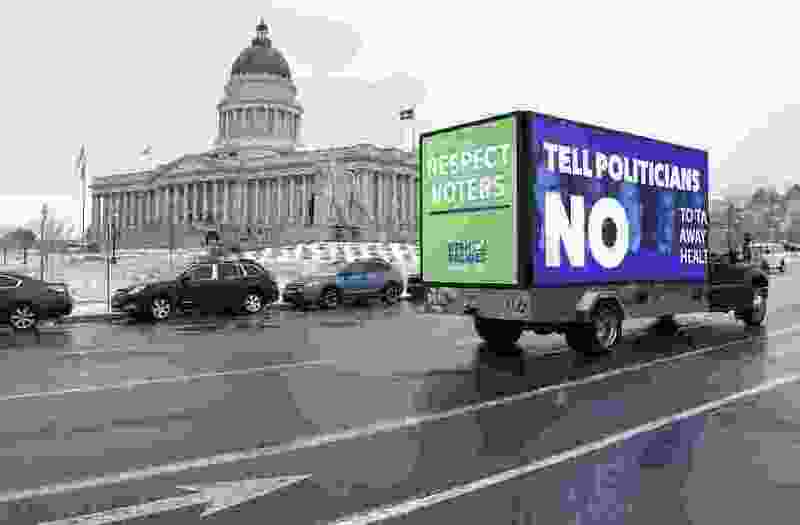 (Francisco Kjolseth | The Salt Lake Tribune) A truck adorned with digital billboards and paid for by Utah Decides circles the Capitol complex during the second week of the session, showing support messages for Prop 3 with “Respect Voters” and other pro-initiative statements on Tuesday, Feb. 5, 2019, as a new Medicaid revamp version of SB96 with “technical changes” recently passed the Senate and moves to the House for consideration. As we near April 1, we wait for word on whether the federal government will approve the first in series of waivers and allow Utah to implements its Medicaid “bridge” program before potentially moving to the partial expansion approved in Senate Bill 96, the Utah Legislature’s bill to replace the Proposition 3 ballot initiative to expand Medicaid. If we had simply stuck with Prop 3, we would know what was about to happen, and a lot more people would be getting covered. But whatever happens, it’s important to remember that the credit for providing coverage to tens of thousands of Utahns should go not to the Legislature, but to the efforts of Utah’s tireless and committed health care advocates, and the choices of Utah voters. Since 2013, we’ve campaigned for Utah’s governor and then the Legislature to accept and implement Medicaid expansion as offered under the Patient Protection and Affordable Care Act. We fought, we spoke up, we pleaded with legislators, and we showed our willingness to make reasonable compromises by supporting Gov. Gary Herbert’s Healthy Utah plan. But at every turn we’d been rebuffed by a Legislature that seemed unwilling to listen, and ideologically dead set on blocking a substantial expansion. So, in 2018, we took the choice into our own hands. We threw our hearts and souls into the Utah Decides Health care ballot initiative. We were relentless in gathering signatures and in giving the public full and accurate information (despite claims by our opponents that voters didn’t known what they were choosing, which insults the intelligence and moral courage of Utah voters). We worked in the rain and the snow. We went through every part of the state. And against the odds, made it on the ballot. We knocked doors, marched parade routes, had extensive phone banking sessions and spoke to anyone who would listen, which turned out to be 53 percent of Utah voters in 59 percent of legislative districts, with an astonishing 75.55 percent voter turnout. We did what some legislators had told us could never be done in Utah. Utah stood up and said determination and compassion are stronger than the fear mongering distortions of the facts of Medicaid expansion that opponents had used for six years. Sadly, we were not able to get the Legislature to honor the will of the voters (their own constituents in many cases) and implement Prop 3 as the well-informed public chose to do. But, while the final version of SB96 wasn’t what we wanted, it could have been a lot worse. In fact, it was a lot worse before huge numbers of dedicated advocates and voters applied enough pressure by speaking up that we forced them to do better. Tens of thousands of Utahns will get the coverage they need. We can celebrate that victory at the same time we mourn for what should have been. This is an important achievement. And it is not the achievement of the Legislature. It’s ours, the advocates and the voters. Every person who gets coverage will get it, not because of a legislator or the governor, but because of everyone of you who gathered signatures, made calls, or voted yes. This isn’t the expansion we deserve or the one we fought for, but the fact that there is any expansion at all is our accomplishment, and no one can ever take that away from us. There is more to do, and we’ve proven we have the will to do it. We’ve made Utah better, and if we refuse to let ourselves defeated, we’ll keep making it better. Utah decided. That will always be true. 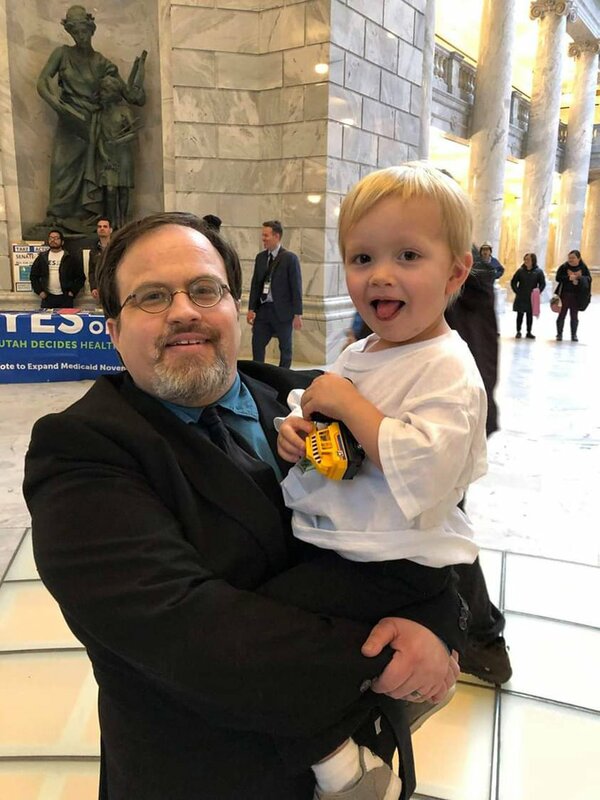 Paul Gibbs, West Valley City, is an independent filmmaker and former Medicaid patient who has advocated for Medicaid expansion in Utah since 2013.